We in the western hemisphere don’t have to look very far to find a civilization that rivals that of ancient Greece and Rome. The Mayan culture in Central America thrived for almost 3000 years in Mexico, Guatemala, and Honduras. Remnants of this great culture were still around to fight the Spanish when they invaded and occupied Central America in the 16th century, and Mayan cultures continue to this day in parts of Mexico, Guatemala, and Honduras. Rather than always looking to Greece and Rome as the fount of all artistic standards, I think it is useful to look at the beautiful artwork of native American cultures to see a fresh perspective on western aesthetics. Although Copán was probably occupied during the Pre-Classic (c1500 BCE- 250 CE) and Early Classic (250-600 CE) Periods, it was during the Late Classic Period (600-900 CE) that Mayan Copán flourished. Most of the monuments and sculpture on the Great Plaza date from the 8th century. Copán is not as large as other Mayan cities, and the pyramids and plazas are of more modest size, but the sculptural decoration of the buildings and the sculpture are the most ornate of any Mayan site. Stele H stands on the Great Plaza, the main ceremonial court of the city. The stele was dedicated to the ruler Eighteen Rabbit (Waxak Lahun Ubah K'awil), one of the last rulers of Copán. The figure, in elaborate feathered headdress and jaguar kilt, was originally brightly painted. The features of the face are considerably softened, and they may represent a portrait of Eighteen Rabbit. In the elaboration of the glyphs, the steles at Copán are unequaled. Each ruler is identified in hieroglyphs on either the side or back of the stele. The hieroglyphs and costume details are deeply carved and give the impression that the stele is a free-standing sculpture. It is however, a relief, only carved on one side. Under each stele at Copán is a chamber which contained small caches of objects such as blades and pottery that were meant to be offerings. The steles all face small, low platforms that are called "altars,” although the use of these platforms is unknown. Stele H is near three altars, all of which contain serpent head carvings which represent the same god (Quetzalcoatl) as the serpent heads at Chichén Itzá. Eighteen Rabbit was one of the last rulers of Copán, the thirteenth of a dynasty of sixteen rulers. He was taken as a captive by the ruler of another city. Soon after, between 800 and 900 CE, the population of Copán drifted away and the city was abandoned, much like many other Mayan cities. Mayan hieroglyphs consisted of human, animal, plant, and abstract forms. Where the name of the ruler is not apparent, a prominent feature of the hieroglyphics designates the ruler. This ruler was named for the appearance of a rabbit below the Mayan symbol for the number eighteen among the hieroglyphics on the back of the stele. 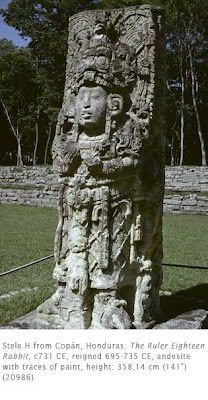 This site has lots of excellent photos of Copán.